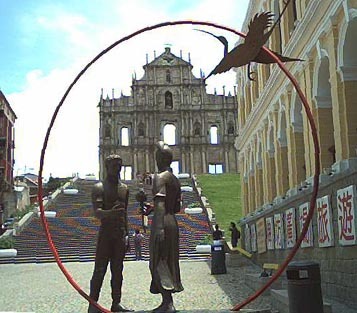 We enjoyed a day and a half with old friends (from Michael's Xiamen University days) in Macao, February 2003. The character above us says "Spring" for we were visiting during Spring Festival (Chinese New Year). 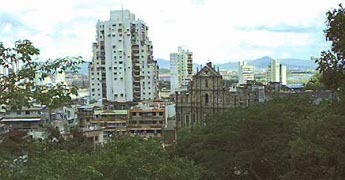 (Above) Historic Macao was a Portuguese colony until 1999. These pictures were taken during our first visit in June, 2000. 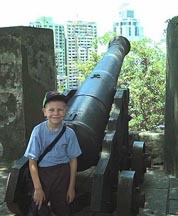 (Right) Andrew poses on the wall of Macao's old fort. 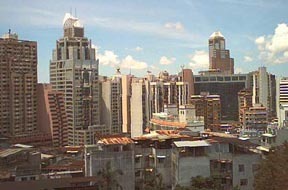 Two more views of Macao. The jet-foil boat ride from Hong Kong takes about an hour. 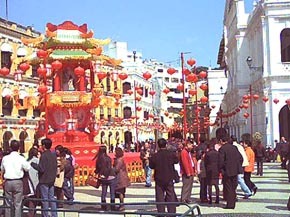 This is the old city square, decorated for Spring Festival 2003.  Macao is best known (unfortunately!) as the only place in China that has legal casino gambling (and all the vices that follow such activity). But it also has many famous restaurants, nice beaches, a quaint historic district, and more! Prices here are considerably lower than in nearby Hong Kong, making it a great place to visit on your trip to Southern Trip.